An integrated model for management and administrative practice. 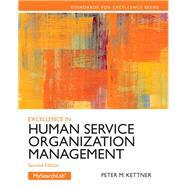 Excellence in Human Service Organization Management, 2/e provides guidelines to insure internal consistency within Human Service Organizations. Integrated in management theory, the model presented in the text is adapted to human service organizations generally and social work issues specifically. The text first identifies problems in organizational functioning as well as proposes what managers need to do to put their organizations back on track toward excellence. Then it guides managers through a plan to bring employees on board and continuously nurture them so they identify their success with that of the organization. Standards for Excellence Series -- Designed to help students advance their knowledge, values, and skills, the Standards for Excellence Series assists students in associated CSHSE's National Standards to all levels of human service practice. Identify problems in organizational functioning. Recognize what managers need to do to get organizations on the track for excellence. Understand what employees need to do to help the overall well-being of an organization. Peter M. Kettner is Professor Emeritus at Arizona State University School of Social Work. He is author or co-author of six books, four of which have been translated into multiple languages. He has also authored over 50 articles, monographs, and book chapters on the topics of program planning, macro practice in social work, human services administration, purchase-of-service contracting, and privatization,. Over his 30 year career in academia he served as consultant to five different state human service agencies and dozens of local nonprofit agencies on their design and implementation of effectiveness-based planning systems and purchase of service contracting practices. In retirement he has continued his writing and consultation with local government and nonprofit agencies. What Is a Systems Perspective? What is Job and Work Design? When Can Job Design and Redesign Be Effective? What Can Work Design and Redesign Accomplish?